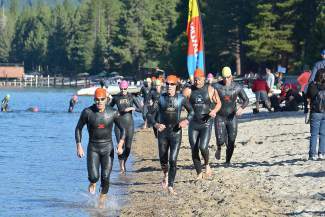 Triathletes exit the water at the start of the XTERRA Lake Tahoe in Incline Village on Saturday. Find a photo gallery from the race at www.lefrakphotography.com. JP Donovan is a race-winning machine this summer. 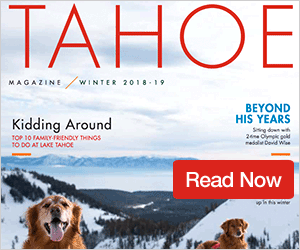 The 27-year-old Incline High cross-country coach won his fourth triathlon in as many attempts on Saturday, this time capturing victory in the XTERRA Lake Tahoe triathlon in his hometown with a time of 2 hours, 47 minutes, 42 seconds. Matthew Balzer, 33, of Reno finished second in 2:49:23, and David Duncan of Shingle Springs was third in 3:05:00. 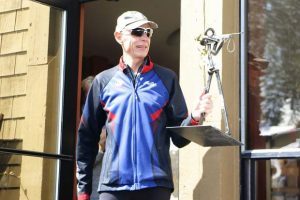 Aside from Donovan’s triathlon victories — which he also earned in the XTERRA Tahoe City, June Lake Triathlon and Donner Lake Triathlon — he is a perfect 6-for-6 in summer races, with wins in both the Squaw Mountain Run and the Ponderosa Ridge Run. 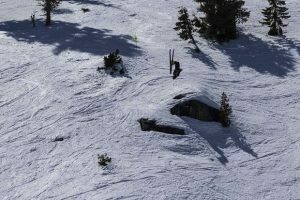 Donovan said he and Balzer swapped leads throughout Saturday’s race, with Balzer exiting the water first, Donovan passing him on the uphill of the bike course, and Balzer again taking over the lead on the downhill by Tunnel Creek. Balzer sped to the bike-run transition with about a 30-second lead, said Donovan, who then chased him down during the 6-mile run. Sian Turner, 33, of Truckee, who was the third female finisher in the XTERRA Tahoe City, was the top woman and 20th overall, posting a time of 3:22:24. Turner was chased by Debby Sullivan of Rocklin, who was 23rd overall in 3:23:59, and Janet Soule of Davis, who was 45th overall in 3:40:54. Rob Laurie of Incline finished fifth in 3:06:47, Donatas Ereminas of Truckee was ninth in 3:10:39 and Paul Roach of Kings Beach was 11th in 3:13:36. A total of 120 people reached the finish line of the Olympic-distance triathlon, which started with two 750-meter swim laps with a 50-meter beach run and was followed by a 22-mile bike ride along the Flume Trail and a 6-mile run. The sprint triathlon, meanwhile, sent 50 racers on a 750-meter swim, the same 22-mile bike as the Olympic course and a 3-mile run. Riley Howard, 22, of Petaluma won the sprint with a time of 2:31:46, and Meiling Yee, 52, of Sunnyvale was the top woman and 16th overall in 3:11:52. Incline’s Ryan Adamson, 47, was the top local finisher, placing 17th in 3:12:00.